What is creativity? Must you be born with it or can it be learnt? How can creativity help you solve problems, generate ideas, and achieve success in life? Welcome to the Game of Thoughts - where creativity is brought to life through a series of fascinating, mind-expanding games and activities. Combining brain teasers, puzzles, conundrums, thought experiments and writing exercises, this one-of-a-kind book will expand your mind, change the way you see things, and turn all your preconceptions of the world upside-down! 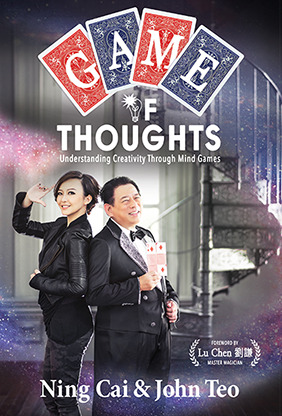 Your guides on this fun-filled journey into the secrets of creativity are two of Singapore's most celebrated magicians. Let them summon your inner creativity and light your path to success. Ning Cai, better known as "Magic Babe" Ning, is an award-winning illusionist/escape artist who has been hailed as Southeast Asia's first professional female magician. She is a TEDx speaker, yoga teacher and bestselling author, with her autobiography nominated for the Singapore Literature Prize. John Teo is a professional trainer by day and magician by night. He is currently President of the International Brotherhood of Magicians (Singapore Chapter) and a certified trainer with the International Professional Managers Association UK.